To evaluate differences in higher order aberrations (HOAs) between femtosecond laser–assisted cataract surgery (FLACS) and manual cataract surgery. In this retrospective cohort study, consecutive patients undergoing FLACS or manual cataract surgery with implantation of an intraocular lens from January 2017 to February 2018 were recruited. Patients underwent aberrometry testing at least 2 months postoperatively. The primary endpoint was internal coma < 0.32 µm, and secondary outcomes included patient-reported vision quality. Generalized estimating equations accounting for within-patient correlation were used for analysis. A total of 57 eyes underwent FLACS (mesopic pupil size: 4.74 ± 1.37 mm) and 50 eyes underwent manual cataract surgery (pupil size: 4.99 ± 1.24 mm). The proportion of eyes reaching internal coma < 0.32 µm was significantly greater following FLACS (54 of 57 eyes, 94.7%) relative to manual cataract surgery (39 of 50 eyes, 78.0%) (odds ratio [OR] = 5.08, 95% confidence interval [CI] = 1.24 to 20.85, P = .024). The median internal coma was 0.10 µm for FLACS and 0.12 µm for manual cataract surgery (P = .005). There were no significant differences in vision quality between treatments (P = .40). All eyes (n = 15) with satisfaction scores of 0 to 10 had internal coma < 0.20 µm, compared to those with scores of 11 to 20 (27 of 29 eyes, 93.1%), 21 to 30 (19 of 30 eyes, 63.3%), and > 30 (8 of 15 eyes, 53.3%) (P < .001). The average internal coma increased by a greater amount for manual cataract surgery than for FLACS for every increase in mesopic pupil size > 5.75 mm. More eyes achieved internal coma < 0.32 µm following FLACS compared to manual cataract surgery. However, this does not account for improved patient-reported vision quality. There was a correlation between internal coma and patient-reported satisfaction, and eyes with excellent patient satisfaction all had internal coma < 0.20 µm. Femtosecond laser–assisted cataract surgery (FLACS) is a new technology purported to improve the accuracy and safety of cataract surgery relative to manual approaches. Using a femtosecond laser, photodisruption and photoionization of optically transparent tissue is produced using an acoustic shock wave.1 FLACS has been used for various stages in the procedure, including the corneal incisions, capsulotomy, and lens fragmentation. There has been an increasing interest in FLACS among both patients and surgeons. This has been particularly attributable to its potential impact on visual, refractive, and safety outcomes due to reduced phacoemulsification time, improved wound architecture, greater accuracy and precision of the capsulotomy, and more predictable positioning of the intraocular lens (IOL) relative to manual cataract surgery.2–6 However, empirical evidence has generally not supported the superiority of FLACS over manual cataract surgery. A meta-analysis by our team in 2016 of 14,567 eyes showed that there were no significant differences detected between FLACS and manual cataract surgery for patient-reported visual and refractive outcomes, as well as for overall complications.7 This was despite the improved effective phacoemulsification time, capsulotomy circularity, postoperative central corneal thickness, and corneal endothelial cell reduction following FLACS. Additionally, it was shown that FLACS was associated with significantly higher prostaglandin concentrations and higher rates of posterior capsular tears. Optical quality is a subjective entity that may only be described from indirect metrics, such as wavefront error measurements, visual acuity, and contrast sensitivity.8–11 In wavefront analysis, the effects of lower order aberrations such as defocus and astigmatism on optical quality are isolated from other higher order aberrations (HOAs).3 In general, HOAs can produce vision errors such as difficulty with night vision and the presence of glare, halos, visual blurring, starburst patterns, or diplopia. Given the limited data that currently exist evaluating differences in HOAs between FLACS and manual cataract surgery, we performed a retrospective cohort study to investigate this issue. Consecutive patients with cataract undergoing either FLACS (LenSx Laser System; Alcon Laboratories, Inc., Fort Worth, TX) or manual cataract surgery (Infiniti Vision System; Alcon Laboratories, Inc.) from January 2017 to February 2018 were recruited from the Specialty Eye Institute, Jackson, Michigan. Patients were only included if they had any HOA measurements performed. A local institutional review board provided approval for this study, and the study adhered to the principles of the Declaration of Helsinki. Square posterior limbal incisions (2.3 × 2.3 mm) were made at the junction of the posterior limbus and anterior sclera. Additional corneal incisions were performed only if there was preoperative astigmatism. Limbal relaxing incisions, where appropriate, were made 7.8 to 8 mm from the optical center of the cornea. For correction of astigmatism, the incisions made did not necessarily need to be on the axis, given the square architecture of the wound. For all cases of astigmatic correction, the following parameters were used: (1) with-the-rule = astigmatism of up to 1.50 diopters (D), (2) oblique = astigmatism of up to 1.25 D, and (3) against-the-rule = astigmatism of up to 1.00 D. For FLACS cases, both the capsulotomy and lens fragmentation were performed with the femtosecond laser. All included implants were either the TECNIS Symfony (Johnson & Johnson Vision, Santa Ana, CA) or AcrySof IQ ReSTOR +2.50 D (Alcon Laboratories, Inc.). Patients underwent routine postoperative evaluations with aberrometry testing performed using the NIDEK OPD-Scan III aberrometer (NIDEK Co. Ltd., Gamagori, Japan) at least 2 months after surgery. This device is able to measure corneal, internal, and total optical aberrations, as well as the autorefraction, keratometry, photopic and mesopic pupil sizes, and corneal topography concurrently for the same axis. Wavefront aberrations were recorded relative to the corneal vertex and reconstructed with the use of a sixth order Zernike polynomial decomposition. For our analysis, the mesopic setting was used. Eyes were not dilated to ensure a more representative measurement of the typical aberration of each eye. The Quality of Vision questionnaire, a 30-item measure assessing patient satisfaction with vision, was administered postoperatively to patients in both groups.12 The following categories were examined by the Quality of Vision questionnaire: glare, halos, star-burst, hazy vision, blurred vision, distortion, multiple images, fluctuation in vision, focusing difficulties, and depth perception. For this instrument, four variations are provided on each item (0 = not a problem, 1 = mild, 2 = moderate, and 3 = severe), for a total score ranging from 0 to 90 with 0 representing the best possible outcome. The primary endpoint was the difference in internal coma between treatment comparators, analyzed as a categorical (normal < 0.32 µm) variable.13 Internal coma was chosen because of its ability to accurately measure microtilt from asymmetrical overlap of the anterior capsule on the optic. Coma aberrations typically form an image of a blurred spot with a comet-shaped tail, which results from either incident wavefront tilt or decentration relative to the optical surface.3 Secondary endpoints included internal coma as a continuous variable, as well as trefoil, which is an HOA that causes a point of light in an image to be distorted in three different directions.14 Angle alpha, defined as the difference between the center of the limbus and visual axis, was also examined. Scores from the Quality of Vision questionnaire were analyzed for differences between treatments, and were correlated to internal coma scores irrespective of treatment modality. Continuous characteristics were represented with medians and mean ± standard deviation (SD) as appropriate, mean differences (MDs), and 95% confidence intervals (95% CIs). To evaluate the difference in continuous internal coma and secondary endpoints between treatments, generalized estimating equations (GEEs) that accounted for within-patient correlation were computed using a scale linear model. The Wilcoxon rank-sum test was used as a non-parametric alternative for continuous variables. Categorical variables were described using proportions, odds ratios (ORs), and 95% CIs. The proportion of eyes with internal coma less than 0.32 µm was compared between FLACS and manual cataract surgery using GEEs that accounted for within-patient correlation with a binary logistic model. Using the same model, the association of internal coma and patient satisfaction scores with other baseline parameters (ie, 65 years or younger, gender, IOL model, average keratometry 44.00 D or less, and postoperative cylinder of 0.25 D or less) was analyzed. GEEs were also used to investigate the relationship between internal coma of less than 0.20 and less than 0.32 µm with Quality of Vision patient satisfaction scores. SPSS Statistics software (version 23.0; IBM, Armonk, NY) was used for all analyses, and a P value of .05 was used throughout to indicate statistical significance. A total of 34 patients (57 eyes) underwent FLACS and 26 patients (50 eyes) received manual cataract surgery at our center (Table 1). The median patient age was 66.0 ± 6.3 years for FLACS and 68.5 ± 7.8 years for manual cataract surgery. There was a similar gender distribution between groups, with females representing 61.4% of eyes in the FLACS group and 64% of eyes in the manual cataract surgery group. Twenty-five eyes (43.9%) receiving FLACS and 25 eyes (50.0%) receiving manual cataract surgery were right eyes. Overall, there were 82 eyes implanted with the TECNIS Symfony IOL and 25 eyes with the AcrySof IQ ReSTOR +2.50 D IOL. Average preoperative keratometry, postoperative spherical equivalent, and visual acuity were similar between groups. All included eyes had applicable values for internal coma (Figure 1). 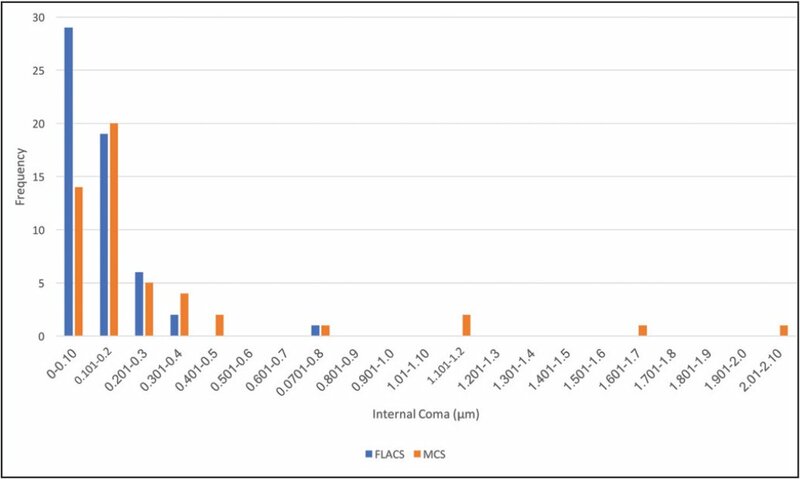 For internal coma testing, the median mesopic pupil size was 4.74 ± 1.37 mm in the FLACS group and 4.99 ± 1.24 mm in the manual cataract surgery group (P = .30). For the primary endpoint, the proportion of eyes reaching the threshold of internal coma less than 0.32 µm was significantly higher following FLACS (54 of 57 eyes [94.7%]) relative to manual cataract surgery (39 of 50 eyes [78.0%]) (OR = 5.08, 95% CI = 1.24 to 20.85, P = .024) (Table 2). When analyzing the data based on the threshold of internal coma less than 0.20 µm, there was no significant difference between groups (FLACS = 48 of 57 eyes [84.2%], manual cataract surgery = 34 of 50 eyes [68.0%], OR = 2.42, 95% CI = 0.82 to 7.15, P = .11). 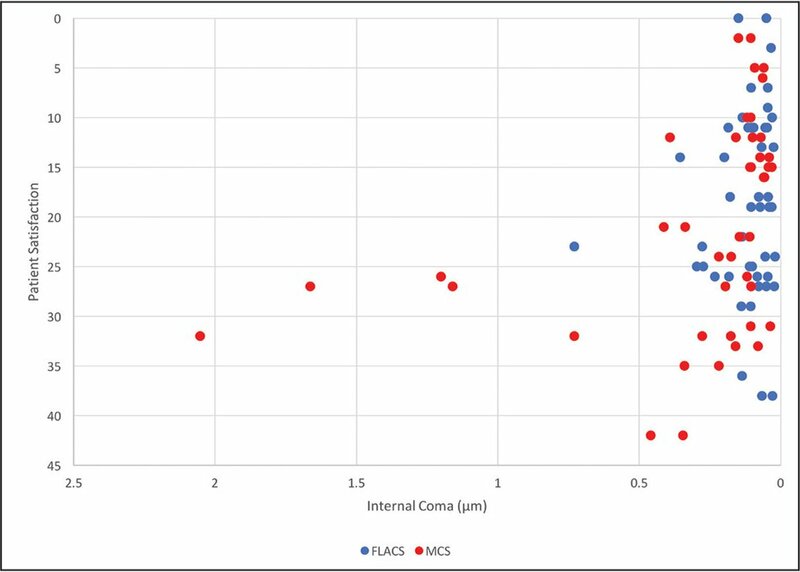 As a continuous outcome, FLACS produced significantly lower values of internal coma relative to manual cataract surgery (Wilcoxon [medians]: FLACS = 0.10 µm, manual cataract surgery = 0.12 µm, P = .005; GEE [mean ± SD]: FLACS = 0.12 ± 0.12 µm, manual cataract surgery = 0.28 ± 0.41 µm, MD = −0.15 µm, 95% CI = −0.30 to −0.006, P = .041) (Table 2). Of the eyes with internal coma of 0.32 µm or greater, median coma was higher following manual cataract surgery (0.46 µm) relative to FLACS (0.36 µm), but no statistical analysis was performed due to low event rates. When the overall analysis was restricted to mesopic pupil sizes only over 5 mm, there was a significantly greater proportion of eyes reaching internal coma less than 0.32 µm following FLACS relative to manual cataract surgery (FLACS = 19 of 22 eyes [86.4%], manual cataract surgery = 12 of 22 eyes [54.5%], OR = 5.28, 95% CI = 1.21 to 23.06, P = .027) (Figure 2). There was no significant difference between groups for the proportion reaching internal coma less than 0.20 µm (P = .32) and continuous internal coma (P = .096). Overall, a mesopic pupil size of 5 mm or greater was significantly associated with the proportion of eyes reaching internal coma less than 0.32 µm (P = .002), less than 0.20 µm (P < .001), and as a continuous variable (P = .01) (Table 2). A third-order polynomial relationship between these two parameters revealed high coefficients of determination for both FLACS (R2 = 0.63) and manual cataract surgery (R2 = 0.70), with the average internal coma increasing by a greater amount for every increase in mesopic pupil size greater than 5.75 mm in manual cataract surgery relative to FLACS (Figure 2). Otherwise, there was no significant association between the proportion of eyes reaching internal coma less than 0.32 µm and age of 65 years or younger (P = .23), gender (P = .91), IOL model (P = .42), average keratometry of 44.00 D or less (P = .63), and postoperative cylinder of 0.25 D or less (P = .12). Similar results were observed for eyes with internal coma less than 0.20 µm and internal coma as a continuous variable. All eyes were included in the trefoil and angle alpha analyses. FLACS was associated with a significantly lower trefoil compared to manual cataract surgery (Wilcoxon [medians]: FLACS = 0.13, manual cataract surgery = 0.22, P = .005; GEE [mean ± SD]: FLACS = 0.17 ± 0.12, manual cataract surgery = 0.26 ± 0.22, MD = −0.089, 95% CI = −0.16 to −0.021, P = .01). There was no significant difference between treatment comparators for angle alpha (Wilcoxon [medians]: FLACS = 0.52, manual cataract surgery = 0.47, P = .37; GEE [mean ± SD]: FLACS = 0.49 ± 0.15, manual cataract surgery = 0.45 ± 0.23, MD = 0.037, 95% CI = −0.056 to 0.130, P = .43). There was no significant difference between FLACS and manual cataract surgery in terms of patient-reported quality of vision (Wilcoxon [medians]: FLACS = 19, n = 46; manual cataract surgery = 22, n = 43, P = .23; GEE [mean ± SD]: FLACS = 18.8 ± 9.3, manual cataract surgery = 21.2 ± 10.7, MD = −2.4, 95% CI = −7.9 to 3.2, P = .40). There were significantly improved patient satisfaction scores in eyes with internal coma less than 0.32 µm relative to those with coma 0.32 µm or greater (Wilcoxon [medians]: < 0.32 µm: 18.5, n = 76, ≥ 0.32 µm: 27.0, n = 13, P = .008; GEE [mean ± SD]: < 0.32 µm: 18.8 ± 9.6, ≥ 0.32 µm: 27.2 ± 9.3, MD = 8.5, 95% CI = 2.0 to 15.0; P = .01). The same conclusion was reached when considering internal coma less than 0.20 µm as a parameter (Wilcoxon [medians]: < 0.20 µm: 16.0, n = 67, ≥ 0.20 µm: 26.0, n = 22, P = .001; GEE [mean ± SD]: < 0.20 µm: 17.8 ± 9.7, ≥ 0.20 µm: 26.6 ± 8.0, MD = 8.8, 95% CI = 3.5 to 14.0; P = .001). All eyes (n = 15) with patient satisfaction scores of 0 to 10 had internal coma less than 0.20 µm, compared to those with scores of 11 to 20 (27 of 29 eyes, 93.1%), 21 to 30 (19 of 30 eyes, 63.3%), and greater than 30 (8 of 15 eyes, 53.3%) (P value range: .001 to .02 depending on analysis; Table 3; Figure 3). When examining associations between demographic and clinical factors with patient satisfaction scores, the only statistically significant relationship found was for gender (satisfaction score < 20: P = .02, satisfaction score continuous variable: P = .01) (Table 3). In our analysis, FLACS was found to have a significantly lower associated internal coma and trefoil compared to manual cataract surgery. There appears to be a greater consistency in the ability of FLACS to produce symmetrical overlap of the anterior capsule on the optic, which lowers HOAs such as internal coma14 (Figure A, available in the online version of this article). In addition, there were more than four times the proportion of eyes not reaching internal coma less than 0.32 µm from the manual cataract surgery cohort (11 eyes, 22.0%) relative to FLACS (3 eyes, 5.3%) (Figure 1; P = .024). However, the same conclusion was not reached when using less than 0.20 µm as a threshold. It is important to note that no significant difference in mesopic pupil size existed between treatment comparators. Future studies should clarify the degree of the correlation between the extent of internal coma and the symmetry of overlap between the anterior capsule and the optic. (A) Slit-lamp examination demonstrating symmetrical overlap of the anterior capsule on the optic in a patient with low postoperative internal coma. (B) Split anterior capsule after femtosecond laser–assisted cataract surgery with associated high postoperative internal coma. Asymmetrical overlap of the anterior capsule on the optic leads to internal coma, which is manifested more significantly under mesopic conditions as the pupil size increases. On average, at a mesopic pupil size of greater than 5.75 mm, there was a greater increase in internal coma following manual cataract surgery relative to FLACS for every increase in pupil size. The difference in average coma between FLACS and manual cataract surgery became larger the greater the pupil size was for any pupil size greater than 5.75 mm (Figure 2). These principles are exemplified in one case from our series, in which the right eye from a 67-year-old patient sustained a split anterior capsule following FLACS. Despite a centered IOL, the postoperative internal coma was 0.728 with a large 6.72-mm mesopic pupil, which was attributable to unequal forces. Past work has demonstrated a positive correlation between vertical coma and vertical tilt, which may be attributable to IOL decentration.3,15 Indeed, a 2016 meta-analysis by our team showed that FLACS had a significantly improved horizontal IOL centration relative to manual cataract surgery.7 In general, internal coma affects the quality of vision under mesopic conditions, especially with multifocal lenses. In reviewing the literature on FLACS, there is little published information on other measures of visual quality. Miháltz et al.3 performed an analysis of 99 eyes in 2011 that showed a significantly lower average intraocular vertical tilt (−0.05 ± 0.36 vs 0.27 ± 0.57) and coma (−0.003 ± 0.11 vs 0.1 ± 0.15), as well as higher mean Strehl ratio (0.02 ± 0.02 vs 0.01 ± 0.01) and modulation transfer function at all measured cycles per degree after FLACS relative to manual cataract surgery. There were no differences in ocular aberrometry parameters 6 months postoperatively, but there was a significant reduction in intraocular vertical tilt and coma following FLACS. There were no differences between comparators in postoperative uncorrected or corrected distance visual acuity, sphere, or cylinder. Although it is known that internal aberrations may originate from either the lens or the posterior corneal surface, it is not currently possible to differentiate between these sources with the NIDEK OPD-Scan aberrometer. Nonetheless, Dubbelman et al.16 showed that the posterior surface of the cornea compensates for approximately 3.5% of the anterior surface coma and that the anterior corneal surface and crystalline lens are the only two factors influencing the coma aberration of the whole eye. The quality of postoperative vision analysis showed that there was no significant difference in patient-reported vision quality when comparing FLACS to manual cataract surgery. Interestingly, lower internal coma following FLACS did not translate to better patient-reported satisfaction with vision. Nonetheless, three observations were made: (1) at internal coma ranging from 0 to 0.2 µm, satisfaction scores varied considerably (range: 0 to 38), (2) at internal coma between 0.2 to 0.4 µm, satisfaction scores were consistently greater than 10, and (3) at internal coma greater than 0.4 µm, satisfaction scores were consistently greater than 20 (Figure 3). This supports the notion that at lower internal coma scores, patient satisfaction was improved but fairly variable, whereas at higher internal coma, no patient reported excellent satisfaction. Even within the group of patients with normal internal coma (ie, < 0.32 µm), patients with lower internal coma experienced an improvement in their own perceived quality of vision, which was confirmed on GEE testing. Our analysis of the data suggests that internal coma of 0.20 µm is the threshold that typically separates excellent from good satisfaction scores. Nonetheless, patient satisfaction scores are not only a function of the procedure performed, but also the expectations of each individual patient. Despite being one of the first analyses investigating HOA outcomes following FLACS, this study is limited by the potential for selection bias and confounding in the findings. Although this study was not randomized, there was no significant difference in internal coma based on baseline parameters such as age, gender, IOL model, average keratometry, or postoperative cylinder. As expected, there was a significant association between internal coma and mesopic pupil size (Figure 2). Two different IOLs were implanted in this study. However, the IOL model was found not to have a significant association with internal coma (Table 2) or patient satisfaction (Table 3). A subgroup analysis limited to patients who received the TECNIS Symfony IOL showed similar differences between FLACS and manual cataract surgery as outlined in the overall analysis. Prior work by Kim et al.17 compared HOAs in 42 eyes receiving implantation of monofocal (SI40NB, silicone 3 piece; Johnson and Johnson Vision) and multifocal IOLs (zonal-progressive Array SA40N, silicone 3 piece, Johnson and Johnson Vision). In the multifocal cohort, HOAs were also measured with the addition of a −0.50 D trial lens, which allowed for the assessment of the compensatory effect on spherical aberration. In photopic conditions (pupil size: 4 mm), coma aberration was 0.15 ± 0.08 µm in the monofocal group and 0.19 ± 0.10 µm in the multifocal group (P = .059). Coma was 0.24 ± 0.15 µm in the multifocal with −0.50 D group (P < .05 for both comparisons). There was no difference between groups for trefoil. This study supports the hypothesis that FLACS produces statistically significant improvements in HOAs relative to manual cataract surgery. There are more than four times the proportion of eyes not reaching internal coma less than 0.32 µm following manual cataract surgery compared to FLACS. Eyes with excellent patient-reported satisfaction all had internal coma less than 0.20 µm. Further research is needed to clarify whether the same conclusions hold true in a more controlled setting. Aly MG, Hamza I, Hashem KAMultifocal IOL dissatisfaction in patients with high coma aberration. Presented at the ASCRS Symposium on Cataract, IOL, and Refractive Surgery. ; March 2011. ; San Diego, CA. .
Rapuano CJ. Section 13: refractive surgery. Basic and Clinical Science Course. San Francisco: American Academy of Ophthalmology; 2012:7–9. Dubbelman M, Sicam VA, van der Heijde RG. The contribution of the posterior surface to the coma aberration of the human cornea. J Vis. 2007;7:10.1–8. From the Specialty Eye Institute, Jackson, Michigan (PHE, LK); the Faculty of Medicine (MP) and the Department of Ophthalmology of Vision Sciences (MBS, IIKA), University of Toronto, Toronto, Ontario, Canada; and the Prism Eye Institute and the Department of Ophthalmology, Trillium Health Partners, Mississauga, Ontario, Canada (IIKA). Dr. Ahmed is a consultant for Alcon, Johnson & Johnson Vision, Bausch & Lomb, Inc., and Carl Zeiss AG. Dr. Schlenker is a consultant for Alcon, Johnson & Johnson Vision, Allergan, and Light Matter Interaction. The remaining authors have no financial or proprietary interest in the materials presented herein.